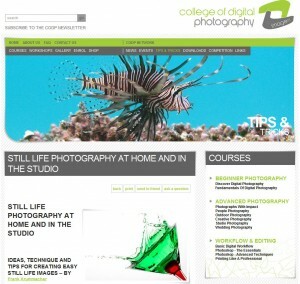 The College Of Digital Photography has a fantastic website and informative newsletter that goes out monthly. I noted with interest and article on their site about Still Life Photography by Frank Krummacher that is a must read. Apart from some fantastic pictures, Frank also goes on to explain how taking Still Life photographs need not require complicated of expensive equipment. He also goes through some of the lighting techniques used. The tips he shares are great whether you are a complete novice to this genre or just need some inspiration. Check out the article and just maybe you will find yourself wanting to learn a bit more like I did.